The first edition of this book was published under the title of Decide for Yourself: How History Views the Bible by Zondervan in 1982 and republished by Wipf and Stock (2004). Print versions of the first edition can be found at Wipf and Stock here. 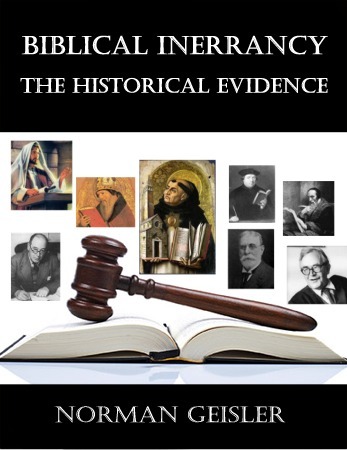 Biblical Inerrancy: The Historical Evidence is a revised, second edition of Decide for Yourself. WHO WROTE THE BIBLE? God or men? If God inspired men to write the Bible, what did He inspire? Their thoughts? Or their words as well? How far does inspiration extend? Does it include only spiritual matters, or does it also include history and science? The battle for the Bible has the average Christian understandably confused. Actually there is more than one battle, for there are at least six views on the nature and origin of the Bible. In using labels to identify the various views of Scripture, we must be aware that such labels are not absolute in the sense that they precisely define all those who hold to one position or another. They represent the core position of each of the various categories, but there is a divergence of view¬points within the categories, and some theologians may even hold to different elements of more than one category. Most evangelicals hold the “orthodox” view (see Chap. 5); that is, the Bible is divinely inspired in its very words, including matters of history and science. This is also the view of The International Council on Biblical Inerrancy. “Liberal” theologians (see Chap. 6), on the other hand, believe that only parts of the Bible are divine. They see great religious value in much of Scripture; but other parts are rejected as myth, and some are even consid¬ered barbaric. Some “Fundamentalists” (see Chap. 7), strongly reacting against liberals, have affirmed that the Bible was ver¬bally dictated by God word-for-word. “Neo-orthodoxy” (see Chap. 8), another reaction to liberalism but without returning to a fully orthodox view of Scripture, holds that the Bible is not a revelation from God. Rather, it is a fallible human record of the revelation God gave in His past actions. That is, God does not reveal Himself in words but only in events. “Liberal-Evangelicals” (see Chap. 9) believe that the Bible is wholly human in origin, replete with historical, scientific, and religious errors. They believe God takes these human words and “elevates” them to be a vehicle of His word. Much of the contemporary debate is between the orthodox or evangelical Christians and the “Neo-evangelicals” (see Chap. 10). The latter believe that the Bible is infallible but not inerrant; that is, the Bible speaks with divine authority and complete truthfulness on salvation matters but is not inerrant (without error) in historical and scientific matters. This book was written for those who do not have ready access to the writings of the main teachers in the church for the past nearly two centuries. As will be seen, their citations support the Orthodox view of the church down through the centuries up to modern times. The other views deviate from the orthodox view because of their acceptance to one or more modern philosophical influences.